The Traditionals range is adapted from the Shenandoah Kit range. 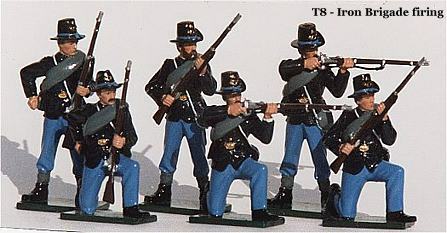 Beautifully painted in gloss enamels, the sets of six figures are attractively boxed and offer the same fine detail and sculpting well known by Shenandoah fans, taking Civil War toy soldiers to a new level. Also now available are a complete range of flag-bearers utilising the beautifully detailed metal photo-etched flags from the Shenandoah Miniatures range. The Army of Northern Virginia battle-flag is available, as are the "Stars and Stripes" and the US Regimental "Eagle flag". Painted to an exacting standard, some variations can be accommodated by request including the Tennessee and Texas State flags. To compliment the Flagbearer (FB) series are the Flag Sets (FS) series. Each set is a six figure mini-diorama including officer and flagbearer, each with its very own story to tell. They form the perfect focal point for your collection of Shenandoah Traditionals.